The Crew of the GCS Dunsparce traveled to the mysterious coordinates provided by Mr. Silver! There they discovered the lost origin world of Humanity, Earth. On Earth they discovered an ancient crystallized tree and the fossilized skull of an ancient Pokemon, among many other interesting specimens. After leaving Earth, the Dunsparce drifted for weeks in warp space until the ship was discovered by the powerful Pokemon Giratina dwelling deep in the void of warp space. Giratina branded Shane with powerful warp abilities which he used to guide the Dunsparce back to civilization. Now the crew prepares to meet with Mr. Silver to share their findings. The Dunsparce approaches the massive ship owned by Mr. Silver. The small bucket flies into the port hangar of the much larger ship and Arlon sets it down. Just like the last time they met with their mysterious employer, the crew are led by a security team to a dimly lit office. The familiar silhouetted figure of a Mr. Mime stands behind the desk, back turned, looking out through the viewport into the vastness of space. The Mr. Mime turns around and looks at the group of individuals gathered in the office. A static horizontal line displays on the screen-face. “We’ve been to Earth,” Morgan continues, a stern tone in her voice. “Ah, yes,” Mr. Silver replies. The line flickers for a moment, displaying the wave-form of Mr. Silver’s voice. It is soon replaced by data from the crew’s scans of Earth scrolling across as he analyzes it. “How much are you willing to pay us?” Dmitri asks. “How much are you willing to part with?” Mr. Silver asks in return. Scans of the samples placed on the desk scroll across Mr. Silver’s screen-face. He appears to be analyzing them and comparing the results to data he already has. “And we have this,” Morgan adds, revealing the skull that she found in the pool. “I see,” Mr. Silver says. He shifts his focus to the skull. The data stream on his screen-face moves faster than ever. “It is... interesting,” Mr. Silver replies. “How do we know you won’t turn back on the deal?” Shane asks. “In my line of business, my word is worth a great deal,” Mr. Silver tells him. He remains focused on Shane, as if analyzing him. “Did you find something else in the void?” he asks. “I assume you’ve noticed by now,” Shane replies. He lifts his arm and shows off the mark from Giratina. “Let’s return to business then, shall we?” Arlon cuts in. “And how much for the other items?” Arlon asks him. “I don’t suppose you’d be willing to pay us a bit more, would you, mate?” Arlon asks. “It was a dangerous mission,” Shane agrees. “One that was probably unsurvivable. But we came back. That should be more than enough to warrant more compensation. “But you did go by choice,” Mr. Silver points out. “We’ll take it,” Arlon tells him. As the crew steps back into the hangar, another ship flies into the hangar. It’s none other than the Red Suns’ heavy frigate, the UAS Corsair. Upon seeing the ship again, Arlon can feel the anger building inside him. They must be the other appointment Mr. Silver was talking about, he realizes. It’s time for Garth to pay for what he’s done. The past few weeks adrift in warp space had given Arlon clarity of thought. In his mind there can be no doubt, no other course of action. It is clear now to Arlon that Devlin Garth had somehow been responsible for the death of Lars Ricketts, the former leader of the Red Suns, and that he had somehow found a way to pin the blame on Arlon. Instead of walking back toward the Dunsparce, Arlon stands across from the Corsair, waiting for his one-time allies to disembark. “What are you doing! ?” Shane shouts at him. “This might be my only chance for revenge!” Arlon shouts back. “We should just leave!” Morgan jumps in. “Let’s just go!” Morgan shouts back. She grabs his arm and tries to pull him away but it’s too late. The ramp drops from the Corsair, revealing Arlon’s former Red Suns compatriots, Devlin Garth, the ruthless man who Arlon so despised, and Rena Bordeaux, the Red Suns’ expert sniper, a woman who had once been very close to Arlon. “I have my own business here,” Arlon responds. “Arlon, will I not be able to do experiments until these guys are gone?” H asks, bored with talking. “No you will not,” Arlon tells him. “Alright then,” H says as he releases his Rhyhorn. This sets everyone off and they all reach for the own Pokeballs and release their Pokemon. Arlon sends out his Houndoom, Shane sends out his Houndour, Morgan her Espeon, and Dmitri his Inkay. 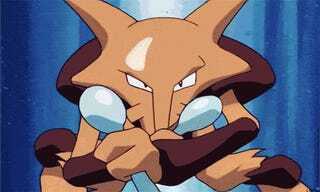 Rena releases her Alakazam, a Pokemon Arlon had seen in action many times. However, the Pokemon Devlin releases fills Arlon with rage. Arlon finds himself facing off with an Aggron. Not just any Aggron, but the one he had trained up from an Aron, the one who had been his faithful companion up until he faked his own death. “How like you! Using my own bloody Pokemon against me!” Arlon shouts at Devlin. Devlin says nothing in response. A slight smirk forms on his face as his Aggron steps forward and lets out a mighty roar. “Cerberus, use Fire Fang!” Arlon commands his Houndoom. The quick canine Pokemon rushes at the Aggron and takes a bite at the large Pokemon with his fiery jaws. Sorry old friend, Arlon thinks. “Yvonne, Bite that Alakazam!” Morgan commands her Espeon. Her Pokemon runs up to the Alakazam and takes a nasty bite at him. “Sorcier, use Focus Blast!” Rena commands her Alakazam, pointing at Arlon’s Houndoom. Ignoring the pain from the bite wound, the psychic Pokemon builds up a ball of focused energy and launches it at Cerberus. The blast hits the Houndoom dead on, sending the Pokemon flying backwards into a nearby crate. Arlon winces at the sound of the Pokemon’s bones cracking from the impact. The Houndoom makes one feeble attempt to get back up, then falls still, dead. “No!” Arlon shouts as he runs to his Pokemon’s side. “You always had too much affection for yer Pokemon,” Devlin jabs, a grin showing on his face. “You’ll pay for this!” Arlon shouts as he releases his Aron. Devlin grunts out a laugh at the sight of the small pre-evolved form of his Pokemon. “F.I.R.E., use Bite!” Shane commands his Houndour. “Finish that Alakazam off!” His Pokemon runs up to the Alakazam takes a nasty bite out of him, taking him down before it can get of another deadly shot. “Cthulhu, Psybeam!” Dmitri instructs his Inkay, pointing at Devlin’s Aggron. “Dodge it!” Devlin commands his Pokemon. The giant metal Pokemon lunges out of the way of the beam, which then flies off and hits the wall. “Now, Titan, hit that Rhyhorn with Iron Tail!” The Aggron roars, then charges at #1. 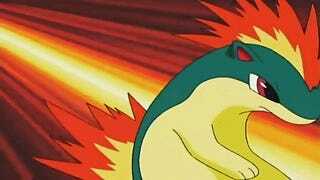 Titan lifts his powerful tail as he approaches and slams it into the Rhyhorn, dealing a mighty blow. “#1, use Stomp!” H commands his Pokemon in response! However, the Rhyhorn misses his mark, still staggering from the hit. H recalls the Pokemon, then grapples away on his extendo-legs. Once a good ways away, H releases his Snorunt. Seizing the opportunity, Rena recalls her fainted Alakazam and sends out her Gardevoir. Shane then vanishes from sight. All the combatants stare at the spot where he had been standing in confusion. It is only momentary, as they are soon sucked back into the heat of battle. “Ballerine, use Moonblast!” Rena commands her Pokemon. The Gardevoir lifts her arms and summons up a massive ball of energy which she then lobs at Dmitri’s Inkay, knocking the Pokemon out with one hit. Dmitri quickly recalls his fainted Pokemon and sends out his Haunter. Without Shane there to instruct her, F.I.R.E. looks at Titan, determining the hulking Aggron to be the biggest threat, then spits out fire at the Pokemon. “Titan, use Iron Defense!” Devlin commands the Aggron. The Pokemon hunkers down and takes a defensive stance, ready for another hit. “Ironhide, use Iron Head!” Arlon commands his Aron, pointing at Rena’s Gardevoir and looking to get some payback. Ironhide charges at the Gardevoir and lowers his head for impact. “Dodge with Teleport!” Rena commands her Pokemon in response. The Gardevoir warps away at the last second, just before Ironhide makes contact, causing the Aron to pass right through open air. Shane then reappears right at the Gardevoir’s new location, his mark burning brightly. He slashes at the Pokemon with his marked hand, delivering a nasty blow. “Wilhelm, use Shadow Punch!” Dmitri orders his Haunter. The ghostly pokemon flies up the the Gardevoir before she has a chance to react to Shane and swings at her with his phantasmic fist, further whittling her down. “Time to finish it #8!” H shouts. He pulls the Snorunt at himself with one of his extendo-legs, then bounces the Pokemon off his chest pogo stick, sending it flying at the Gardevoir. “Headbutt!” #8 slams into the Gardevoir and knocks her into the wall. “F.I.R.E. use Ember!” Shane commands his Houndour. The fiery canine unleashes another like of flames at Devlin’s Aggron, which growls in response. “Time to take you down,” Devlin says calmly. “Stone Edge!” he commands the Aggron. The big metal monster then looks down at the Houndour spitting flames at him and swipes at her with a lethal claw, killing yet another Pokemon. Shane can do nothing but look on with shock and horror. “Ironhide, use Rock Slide!” Arlon commands his Aron. The small metal Pokemon summons up a surge of rocks as he charges across the room at Rena’s Gardevoir, and then unleashes them, knocking the Pokemon out of the fight. Rena immediately recalls her Gardevoir and sends out her Metagross. “That’s enough for you, mate,” Arlon says as he recalls his Aron in response. He then pulls out a different Pokeball and releases his Quilava. Dmitri also recalls his Haunter, then he and Shane send out new Pokemon. Dmitri his Trapinch, and Shane his Clefairy. “This beast is a problem!” H shouts. He pulls out one of his string shot grenades and throws it at Devlin’s Aggron trapping it in place to keep it from doing any more damage. “Nice work, mate!” Arlon shouts to his crewmate. With the Aggron out of the picture, Arlon sets his sights on Rena’s Metagross. “Cinder, use Ember!” His quilava spits out a lick of flame at the giant metal Pokemon, dealing some significant damage. “Yvonne, use Sand-Attack!” Morgan commands her Espeon. The quick Pokemon kicks up some dirt and dust from the floor into the Metagross’s eyes, temporarily blinding it. “Ordinateur, use Shadow Ball!” Rena commands her Pokemon in response. The Metagross fires off a ball of dark energy back at the Espeon, but due to its blindness it is unable to meet its mark. “#8, use Powdered Snow!” H commands his Snorunt. The Pokemon follows up Yvonne’s attack with a blast of snow, slowly whittling the Metagross down. Dmitri then raises his hand and casts out a blast of hypnotic energy, putting the Pokemon to sleep. Titan attempts to land an attack of his own, but he is unable to break free of the string trapping him in place. The Aggron can do little more than thrash about wildly. H seizes the opportunity to blast the Pokemon with a surge of electricity. Realizing that his Pokemon is not useful in his current condition, Devlin recalls him, causing the string falls uselessly to the floor. He then reaches for another Pokeball and sends out his Absol. Both Arlon and H command their Pokemon to attack this new threat. The two launch their attacks, hitting the Absol hard and fast. “R.A.G.E., use Wake-Up Slap!” Shane commands his Pokemon. The Clefairy bounces up to the sleeping Metagross and smacks the metallic Pokemon around as hard as he can, dealing a ton of damage. The Metagross wakes up for a brief before falling to the ground, unconscious. Rena recalls the Pokemon, then turns and walks away. “Don’t you walk away from me!” Arlon shouts at her, still angry that her Pokemon killed his Houndoom. H grapples himself up onto the ceiling above Rena and throws another string shot grenade. Rena grunts as the grenade collides with her and then lets out a sound of pure disgust as it explodes, covering her with sticky string and trapping her in place. Now everyone shifts their attention to Devlin and his Pokemon. Dmitri fires off another blast of hypnotic energy at the Absol, but the quick Pokemon dodges out of the way. “Cinder, use Ember!” Arlon commands his Quilava. “Pandora, use Sucker Punch!” Devlin commands his Absol as the fiery Pokemon prepares to attack. The Absol runs up to the Quilava and takes a swipe at her, knocking her out before she gets a chance to attack. “#8, use Powdered Snow!” H commands his Snorunt. The Pokemon fires a blast of snow at the Absol, but she doesn’t seem to mind. “Biollante, use Rock Slide!” Dmitri commands his Trapinch. Biollante summons up a massive tide of rocks and hurls them at the Absol, absolutely flooring the Pokemon, taking her down in one hit. Devlin quickly recalls his Absol and sends out his Tyrantrum, a lethal brute of a Pokemon that Arlon is all too familiar with. The Tyrantrum lets out a mighty roar as he emerges from his ball. H immediately blasts it with another bolt of electricity while his crewmates switch out their Pokemon. Dmitri switches back to his Haunter while Arlon sends out his newly evolved Frogadier. “Jiraiya, use Water Pulse!” Arlon commands his Pokemon. The Frogadier spits out a blast of water at the Tyrantrum, landing the first hit on the beast. “#8, use Powdered Snow!” H commands his Snorunt. The Pokemon shoots off another blast of snow, dealing a bit more damage to the Tyrantrum. “R.A.G.E., use Sing!” Shane instructs his Clefairy. The Pokemon lets out a soothing melody which puts beast to sleep. 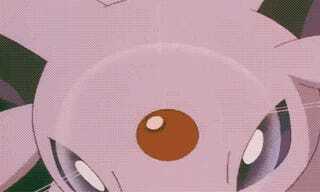 “Now use Wake-Up Slap!” The Clefairy approaches the sleeping Tyrantrum and hits it hard, delivering a nasty blow. The Tyrantrum snaps back to alertness, but before he can react, the others instruct their Pokemon to attack. “Use Water Pulse!” Arlon commands his Frogadier. “Use Powdered Snow!” H commands his Snorunt. The two Pokemon unleash their attacks and bring the Tyrantrum down. Devlin recalls the Tyrantrum and releases Titan once again, now free of his sticky restraints. This time the crew is prepared and unleash the full force of their Pokemon. The Aggron manages to endure through the hits and prepares to fight back. “Use Iron Tail!” Devlin commands the Pokemon. Titan lunges forward, then slams his tail down at #8. The Snorunt miraculously manages to dodge out of the way at the last second, leaving the Aggron vulnerable for another hit. “Jiraiya, finish him off with Water Pulse!” Arlon commands his Frogadier. The frog Pokemon fires off one last pulse of water and finally takes Titan down. Devlin recalls his Pokemon, then turns and starts running. Still hanging from the ceiling, H quickly lobs another string shot grenade at Devlin, stopping him dead in his tracks. “You’re coming with us,” Arlon tells him coldly. Back aboard the Dunsparce, Arlon shoves Rena and Devlin into the cargo hold rather harshly. He moves to follow them inside but Morgan grabs his arm. “You need to calm down,” she tells him. “I am calm,” he replies coldly. He then nods over at Rena. “Keep her in earshot. I’ll take care of him.” He then shifts his gaze to Devlin. “’Bout what?” Devlin responds snarkily. “You attacked us,” Arlon retorts. “You and I both know I had nothing to do with what happened on Parisia!” Arlon shouts at Garth, slamming him into the crates again. “Do we?” Garth replies with a sarcastic tone. Devlin just smirks at him. “What’s there to tell? Really not that much of a story. I saw an opportunity and I took it and there ain’t nothin’ you can say to prove it.” He just smirks at Arlon. “Ya gonna shoot me?” he asks, glancing at Arlon’s hand resting on his gun. Arlon unholsters it and presses it up against the base of Devlin’s chin. “I would very much like to,” he tells him. “But you’re no good to me dead. Now move,” he adds, shoving Devlin back toward the center of the cargo hold. “I think someone has something to say to you. Arlon brings Devlin back around the corner where he sees Rena glaring at him. His smug expression quickly vanishes, replaced by one of defeat as he realizes that he talked his way into a corner. Arlon shoves him down onto the floor. “I suppose I do,” she responds, still eyeing him suspiciously. “So what happens now?” he asks. “I’m not sure,” she tells him. Session/Revision Notes: And yet another long session. We went over by two hours this time. This was really the point in the campaign where we just got super into it and just wanted to keep going at the end every session. Of course, because of that I had to split this rewrite into two parts. The big thing that happened this session was that Arlon got to achieve his character goals. This was around the point when I decided I was going to roll a new character for Volume 2 and DragonStorm and I had discussed that I wanted to at least achieve my goals for Arlon before the end of Volume 1, but I hadn’t expected it to happen this session. The battle with the Red Suns was intense. It was the first time we had Pokemon deaths, and they both happened to be of the same evolutionary line. F.I.R.E. and Cerberus who were caught together on Silicron all those weeks ago have been laid to rest. I was kind of bummed when my Houndoom died since it was going to be one of the key members of my team, but in the end I ended up just keeping Quilava on my team to cover fire types and then stuck with my Mightyena for dark type. After the battle, It was time to interrogate Devlin Garth and dive into Arlon’s backstory The whole thing ended up being straightforward, but then again, Arlon was a pretty cut-and-dry character. He actually became much more interesting in Volume 2 as a side character who would appear from time to time. It was fun to go back and expand upon Arlon’s backstory in the origin story I wrote for him before I began these rewrites and I got to tie in some details from that into this chapter which was neat. The big one being that Devlin’s Aggron is actually the very same one Arlon used to have before the start of Spacemon, the very same one you saw in action in the origin story. So that wrapped up Arlon’s plotline, leaving only the main plot to get to, which is built off of the meeting with Mr. Silver at the beginning of this chapter. And that’s what will be covered in the second chapter from this session which I’ll be posting tomorrow. If you’re interested in the original version of this chapter, you can find it here. 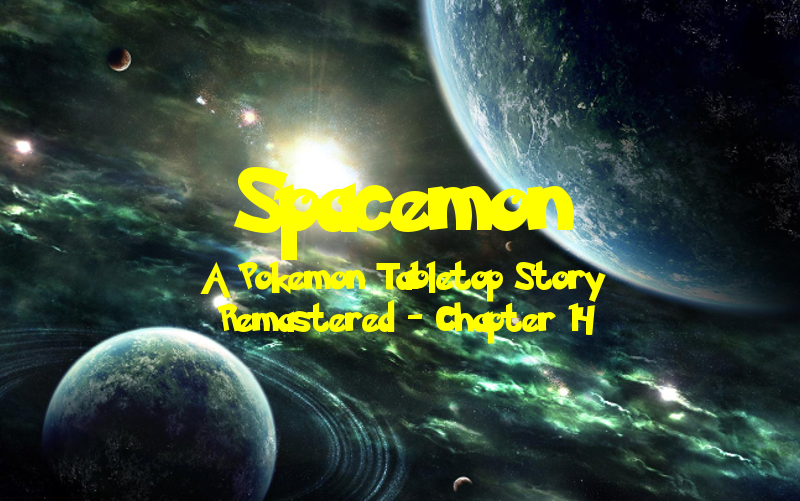 As mentioned before, it covers the events of both this rewritten chapter and the next.